Our delicious Morello Cherry Kefir Smoothie is an award-winning cultured milk drink made with the highest quality British milk and authentic live kefir cultures, with only morello cherry purée added. 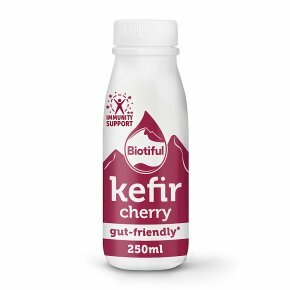 The original bio-live drink, our Kefir is naturally packed with billions of gut-friendly bacteria and contains 7.8g of protein per portion. It is high in calcium and a source of essential vitamins (including B2 and B12) which contribute to the normal function of the immune system, metabolism and reduction of tiredness. Kefir also improves lactose digestion. Free from any artificial colours, flavours or preservatives, our Kefir Smoothie is also gluten free and has no added refined sugar. Nutritious and light, it is a great on-the-go breakfast, a perfect snack or a wholesome dessert. Enjoy the sumptuous, fruity taste and delicate texture. British milk & live cultures. No refined sugar added. Free from any artificial colours, flavours or preservatives. Our delicious Morello Cherry Kefir Smoothie is an award-winning cultured milk drink made with the highest quality British milk and authentic live kefir cultures, with only morello cherry purée added. The original bio-live drink, our Kefir is naturally packed with billions of gut-friendly bacteria and contains 7.8g of protein per portion. It is high in calcium and a source of essential vitamins (including B2 and B12) which contribute to the normal function of the immune system, metabolism and reduction of tiredness. Kefir also improves lactose digestion. Free from any artificial colours, flavours or preservatives, our Kefir Smoothie is also gluten free and has no added refined sugar. Nutritious and light, it is a great on-the-go breakfast, a perfect snack or a wholesome dessert. Enjoy the sumptuous, fruity taste and delicate texture.